his disciples say to him ... Where do you want us to go to prepare so that you may "eat the passover"? 14:13 And he sends away two of his disciples. And he says to them ... Under-lead into the city. And you will meet a man bearing an "earthenware vessel" of water. 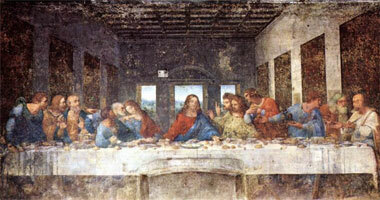 Where is my guestchamber where I may eat the passover with my disciples? 14:15 And he will show you a "great upper room" having been spread ready. And there prepare (the passover) for us. 14:16 And the disciples went out. And they came into the city. And they found ... just as he said to them. 14:17 And of evening having come, he comes with the twelve. the one eating with me. and to say to him "one down to one" ... Not me? the one dipping with me into the dish. 14:21 Indeed the "son of man" under-leads just as it has been written about him. But Woe to the man through whom the "son of man" is given up. Ideal to him if that man was not born! he broke (it) and he gave (it) to them, and he said ... Take (it), this is my body. and they all drank out of it. the (blood) being poured out over many. till the day whenever it is, I may be drinking new in the "Kingdom of God."